The Metropolitan Sewer District is budgeting $200 million for the Ohio River Tunnel project to improve water quality in Louisville. 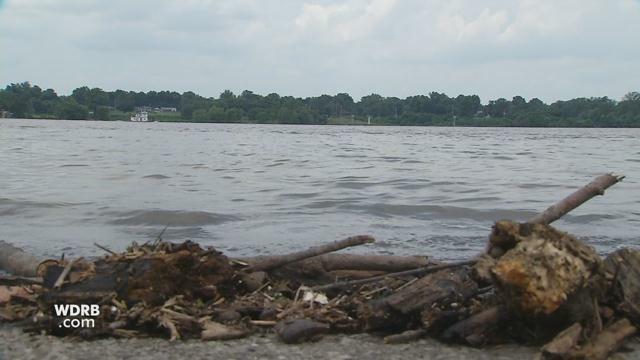 LOUISVILLE, Ky. (WDRB) – The Metropolitan Sewer District is budgeting $200 million for the Ohio River Tunnel project to improve water quality in Louisville. According to Jacob Mathis, an MSD engineer and manager of this project, just a tenth-of-an-inch of rain can overwhelm parts of the sewer system in the district, sending stormwater and drainage straight into the Ohio River or Beargrass Creek. “In a typical year, there’d be four billion gallons of sewage released into these waterways,” Mathis said. In hopes to reduce sewer drainage across the country, the federal government is requiring communities to find ways to mitigate the damage by Dec. 31, 2020. If Louisville does not meet the deadline, the government could enforce fines or penalties. In response, MSD engineers devised a plan of three new basins in three different neighborhoods to store overflow. But there were concerns over how much that could interrupt construction, business and daily life. MSD decided to take a different route and came up with the Ohio River Tunnel project. “This project is one of the first of its kind in Louisville or even the state of Kentucky,” Mathis said. Engineers describe it as being on the same level and magnitude as the Ohio River bridges undertaking. But this project is intended to be out of sight, out of mind. The tunnel will start underneath what will be the western part of Waterfront Park near 13th and Rowan Streets. It’ll head east underneath the Ohio River towards I-64. At the Second Street Bridge, the tunnel then jogs inland to Butchertown. Finally, it turns south and ends at Main Street. It will be about two-and-a-half miles long, 20 feet in diameter and 200 feet underground. The tunnel alone will hold 37 million gallons. That’s at least three million gallons more than what the three original basins combined would have been able to handle. So whenever there is a big storm, overflow will be stored in the tunnel until the plants can catch up. “As an engineer, he exciting part of this is that probably less than ten communities have undertaken a project of this size or magnitude,” Mathis said. Engineers predict the project will reduce the amount of sewer overflow by 96 percent. “We anticipate the project itself, the tunnel, lasting for centuries,” Mathis said. There will be no federal funding provided for the project. It will be fully funded by MSD customers’ rate payments. 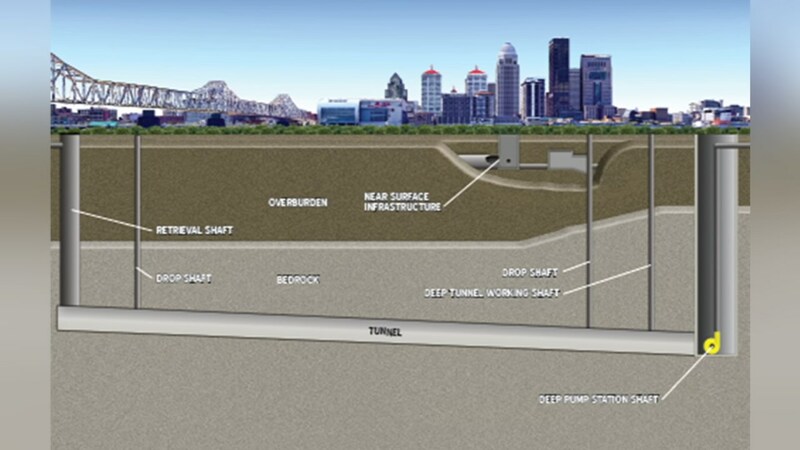 The Ohio River Tunnel project will be split into four parts. Two of those will go out for bids in September. MSD engineers hope to start construction in October and intend to have all sections completed before the federal deadline of Dec. 31, 2020.